This time around when you are called for the "IPT" : Initial POWER Test; you can bring a POWER test card from a certified site such as NIPSTA. The idea is to take pressure off applicants so they can get the certification on their own. You can take the POWER as many times as you wish as long as you are willing to pay the fee. I used a power card for the ipt from the april 2017 test so that's nothing new. Final power has to actually be done at the academy. Although seeing the way things are going (no power tests IN the academy) I could see them allowing them for fpt as well. I’ve received POWER cards at both Triton and NIPSTA. If you fail a component of the test at Triton, you’re no longer able to continue on and see how you perform. At NIPSTA, you’re allowed to. They also are more lenient with the sit-ups but do mention they’re aware of it, so it’s ok the candidates to learn the form properly. Triton has more dates, but is slightly more expensive fhan NIPSTA. Will they accept power cards from JJC also? So i'm from the suburbs, I'm tempted to start this process but my family and GF don't think its safe. 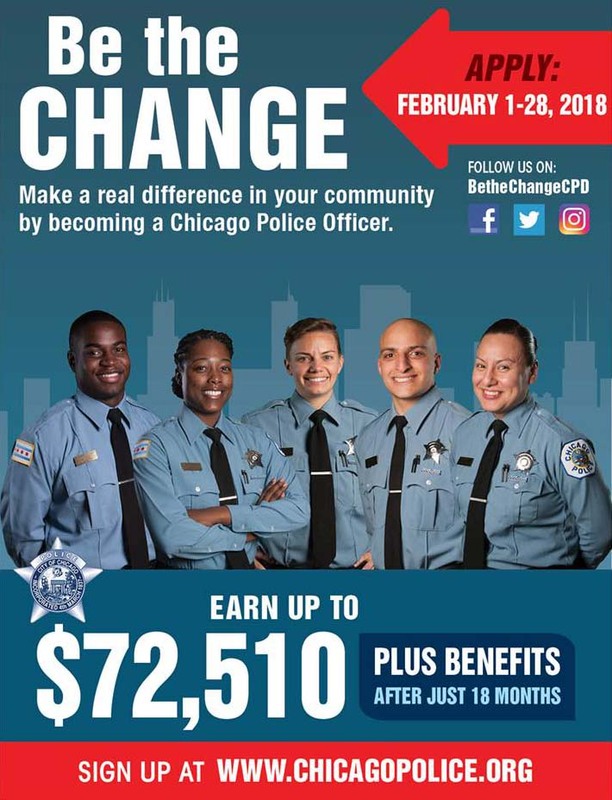 Does anyone that's currently CPD or know anyone that is CPD think this is a really dangerous job for new recruits. I heard you start doing foot patrol in bad neighborhoods in Chicago. Only reason I would consider this is an opportunity to lateral into suburb departments. I know police jobs all have safety risks but is CPD super dangerous like everyone makes it seem? I have been OTJ here for almost 30 years here. The only SMART way to work in the CPD is to consider yourself a "glorified report taker with a gun." In-car cameras and body cameras that MUST be turned on. COPA is randomly reviewing video footage and issuing complaints against officers now for the smallest of things. The communist police-hating politicians are all behind all of this and want to put police officers in the penitentiary. In my district we have MANY 5 foot tall female officers coming fresh out of the academy and they are doing fine. Here at the once great Chicago Police department the bar has been set pretty damn low. Just give the victim a report and say detectives will follow up on your case. The pay and benefits are still pretty good. Collect a pay check on the 1st and 16th of the month. Bury as much money as you can in the 457D plan and the collect your pension after 29 years and 1 day of service. Stay away and stay in the suburbs. Better yet test outside of IL. At most get your certification and then leave. Why the hate with chicago? A lot of hate in general on this forum. Connections at Human Resources are saying only around 3000 signed up so far with 3 days to go for this exam. It will be interesting to see how the city will spin this in the media. Probably LIE as usual and just multiply the numbers by 3. Another exam still in the works for November/December. I dont see why the would try to spin it. it would be a big problem if only 3000 signed up after not giving an exam for a few years. they gave 2 last year, 1 in 2016. i think 3000 is fair for having 3 tests in less than 2 years. Hopefully those of us waiting on a appeal date will get contacted soon enough..
WHAT DATE IS THE POWER TEST IN MAY 2018 ??? Hello, thank you for your posts. Question: Do you know when the Initial POWER test will be held for the CPD in May? How many times can I take the POWER test with the CPD? I took the POWER test Mar 10 and failed. I want to take the POWER test with NIPSTA in advance to take off the pressure and be prepared. Thank you in advance. No one knows when the IPT will be for May’s exam. They might still be finishing IPT for December’s exam. No clear answer for the POWER test attempts. Some people had one attempt, others had a few. The POWER card from the community colleges or NIPSTA are only good for the IPT. You’re still required to take the FPT. One of the officers at my IPT said the most FPT failures came out of JJC, presumably because they were the most lax. Triton is the strictest and most similar to the actual POWER test. NIPSTA tells you how it should be done and can pass you without that exact form (sit-ups for example). Thank you NGUChris. I found this information helpful. Can anyone tell me what the work schedule will look like? Hours, days, lunch breaks, etc?? Where are officers straight out of the academy placed? Any information is appreciated. Thanks! In the Academy, you’ll work Monday-Friday, usually from 0645a-1530hrs. Lunch is 1 hour. Out on the streets, you’ll work 4 on, 2 off. The hours depend on which watch (shift) you work and whether you’re early car or late car. There’s an hour and a half difference between early and late car. For example, I work 1st watch (midnights), and early car starts at 2100hrs, and late car starts at 2230hrs. Lunch is 30 minutes, and you also get a 15 minute personal. Towards the end of the Academy, you will receive a wish list asking the top 3 districts you’d like to train at. The wish list is NOT guaranteed. You will spend your 3 months of field training at just ONE district now, and you’ll ideally rotate working each month on a different watch. After you’re field qualified, CPD will determine whether you stay in your current district, or if you are relocated to a different district. You will spend the duration of your probationary period in the district you are detailed to after your field training cycles. Upon the completion of your probationary period, CPD will permanently assign you to a district. I applied for an exam reschedule because I have drill with the National Guard that weekend. I received an email saying they would make a decision AFTER the May 5 exam date and if the request is granted I would test in the fall of 2018. If the request is not granted, I would have to reapply and to test in the fall of 2018 - does this mean I'll effectively be missing out on this exam process? Are they holding an entire new application process in fall 2018? There are currently 6521 users online. 245 members and 6276 guests.